The Victorian Government has signed two contracts under the Melbourne Metro’s Anzac station project. Ausreo has won the contract to supply more than 3,800 tonnes of steel reinforcement for the roof and Holcim will supply 15,000 cubic metres of concrete for the roof slabs. Anzac station has been designed as a ‘pavilion in the park’, as an integrated public building and landmark that connects seamlessly with surrounding parklands. It will also make it easier to visit some of Melbourne’s most valued parks and attractions such as the Shrine of Remembrance, the Royal Botanic Gardens and Albert Park. The canopy above the tram interchange will be an architectural focal point, providing waiting passengers with year round weather protection. 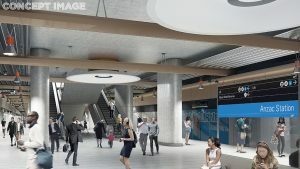 A large skylight embedded in the tram stop will fill the station concourse below with natural light. The station is strategically placed to ease pressure on the St Kilda Road/Swanston Street tram corridor, which is the busiest tram corridor in the world. It will feature a convenient, direct train/tram interchange within a new tram super stop on St Kilda Road. Anzac station will allow time savings of up to 25 minutes for passengers on the Cranbourne and Pakenham lines. The station will serve thousands of people destined for the employment and residential precinct along St Kilda Road every day and support the continuing growth and redevelopment of the South Melbourne / Kings Way precinct. “The Metro Tunnel is taking shape across the city, so we can run more trains to the suburbs, more often,” Premier Daniel Andrews said.